My friend Jurgen was visiting one morning recently with his 3 year old daughter Eva. While Eva was busy playing in the little school bus that is semi-permanently parked in my living room, I offered Jurgen a cup of tea. The water was hot. He brewed his own cup, and asked for some kind of milk and sweetener. I offered soy milk and agave. As I said it aloud, for a moment I felt a twinge of embarrassment, sounding, I thought, so “California”. I got over my embarrassment quickly. Perfect he said. When he was putting the soy milk back in the frig, looking for where to place it, I called out, “top shelf”, then watched as he set it down and said to me, “Now that’s a refrigerator”. Later I looked to see what provoked his comment. Beside the soy and almond milk, there were so many bottles, at first glance I thought he’d probably thought the whole top shelf was alcohol and sodas. There are two or three left over beers and sodas from parties several years ago (I don’t drink either so they last a long time). 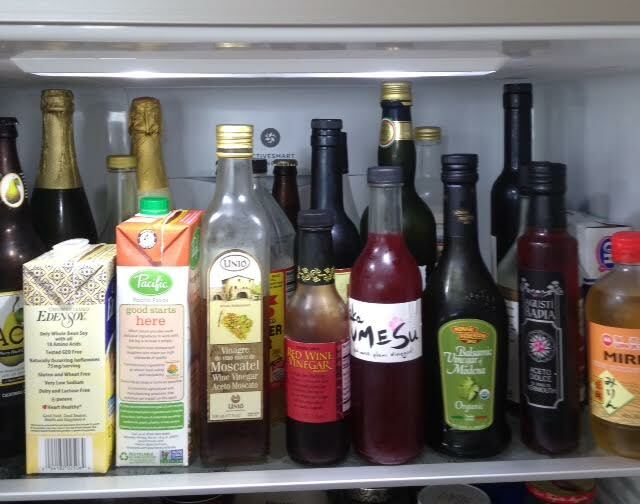 On closer inspection, I saw… mostly, vinegars. I found this odd, since 99% of the time, I use either apple cider vinegar or rice wine vinegar, for my salad dressings. These are the working class of the vinegars and do most of the heavy or light lifting when needed in salad dressings or other things. Sometimes a little dark balsamic too. The 1%, not dissimilar to our human one percent, the least useful, were taking up most of the shelf space. I don’t know why I fall prey to their seductive message. On the shelf at Rainbow Grocery, they whisper to me buy me and your life will become more meaningful and exciting. I hear them. I admire them. I buy them. My life does not change. Just like people buy the politician’s crap. I’m thinking Donald Trump here. Not Bernie Sanders. Bernie Sanders is apple cider vinegar if ever there was one. Honest, raw, organic, natural. No hype. After awhile, Eva joined us for a snack. Cut up apples, cheese and crackers. 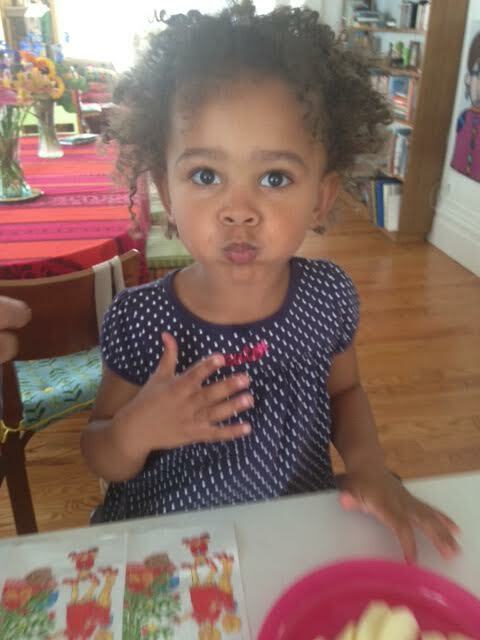 Here she is with her mouth over-filled with cut up apples, just the way she likes to do it. I put the vinegars on the counter to photograph them, all 15 of them (in case you’re counting, a couple are missing from the picture). Now they’re back on the shelf. Fortunately vinegar lasts a long time. 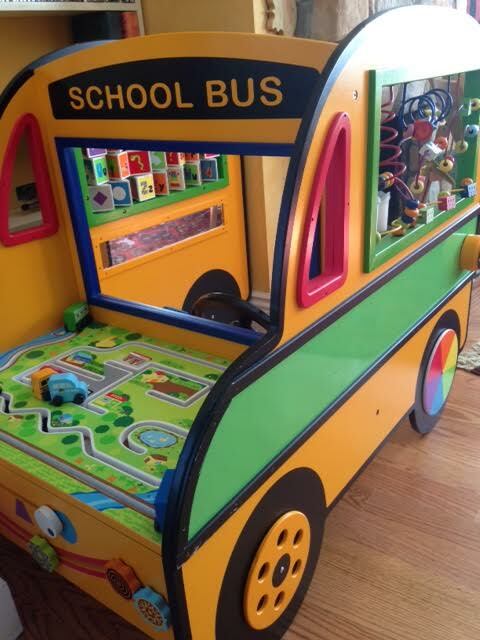 I hope Eva comes to drive the living room school bus again. I hope Jurgen comes again for tea. I hope Bernie Sanders gets elected. Or possibly another similar raw organic apple cider vinegar kinda guy or woman, someone who identifies with the 99% – the apple cider and rice wine vinegar folks, and a little dark balsamic. I love vinegars–Caitlin and I are known to drink it– and remember a week of dieting with my Dad where the magic cocktail was cider vinegar and honey. I love that you have the little school bus and I love you! Ah yes! Drinking vinegars. I too drink a daily “cocktail” of one to two teaspoons of raw apple cider vinegar (with the “mother”) mixed with 8 oz. of water. Putting in honey makes it a sweet tart drink which is yummy, but it also tastes good without the honey, and is reputed to be beneficial for just about everything — boosting immunity, calming a hyper-acidic stomach (paradoxically), and probably a million other health benefits.